Pure Eye Candy! 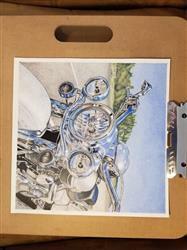 The goal of this dazzling at-home tutorial is not to create a photo-realistic image - but instead enjoy the magic that colored pencils can bring to the look of a highly-chromed Harley Road King. Have fun and bring the spirit of play to your project. The clear instruction by artist Rhonda Dicksion will guide you through 30 detailed steps for mastering reflective chrome in Rhonda's lively style. Includes line drawing, full color images, Prismacolor color chart and detailed method overview. 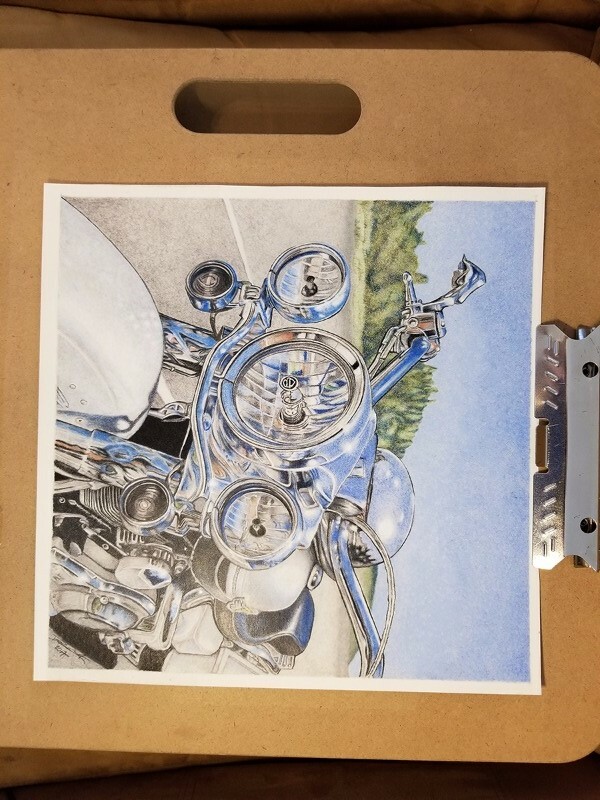 Reflection: A chrome subject on a bright sunny day might seem intimidating to achieve with colored pencil - but Rhonda walks you through each step by step process for getting the mirrored reflection to just blast off the paper. Video Extras: Take a closer look at key elements of the project along the way with links to video instruction. Section by Section: How you render the background - sky, bluff and asphalt - will determine how much pop your finished piece has. This background-first approach allows you to get comfortable with the subject before diving into chrome. Printed in the USA. Publish Date: April 2017. I rank this one right up there with "Silver Reflections." It was a project that I put away, took back out, worked, put away, repeat over a 6 month period. It was not "easy," but as with Ann's other kits, the results I achieved through patience and following the directions were amazing. I learned so much and produced a piece that just looks great! The author did a first rate job of composing this tutorial. I honestly don't grasp how she or anyone is able to concurrently produce a magnificent piece of reflective art, and at the same time, capture how she is doing it. I never know until after I've done something whether it "will work" or not. I'll add that I particular enjoyed that this wound up being the largest pencil piece I've done, and I appreciated that the author went to the trouble to spread the line drawing across multiple pages. This allowed me to simply print, tape together and then transfer. LOVED it!! I loved this project. It's a large picture so it took awhile but it was really fun watching it come together. It's definitely different than the projects I usually do. I actually looked at this several times before I finally purchased it because I thought it looked really difficult, but it really isn't. I love drawing textures and this was full of it. It has everything from the shiny chrome to the "pebbley" leather seat to the roadway. Very enjoyable! It is rather difficult and detailed, but I'm enjoying the challenge. I'm not quite finished yet so I don't have a photo to upload. Very nice instruction. I don't like having to tape the picture together. Any way to get the whole picture?